The Audi e-tron Sportback represents an important milepost for Audi along the road to electric mobility. Rupert Stadler, Chairman of the Board of Management of AUDI AG, confirmed: “Our Audi e-tron will be starting out in 2018 – the first electric car in its competitive field that is fit for everyday use. With a range of over 500 kilometers (310.7 miles) and the special electric driving experience, we will make this sporty SUV the must-have product of the next decade. Following close on its heels, in 2019, comes the production version of the Audi e-tron Sportback – an emotional coupé version that is thrillingly identifiable as an electric car at the very first glance.” In its consciously light-colored interior the Audi e-tron Sportback concept offers a blend of functional clarity and reductive controls as a formal principle. Expansive touch-sensitive screens below the central display, on the center console and in the door trims supply information and interact with the on-board systems. Horizontal surfaces on the dashboard and the seemingly floating center console convey a sense of open perspectives for the occupants of the four individual seats. For its drive, the e-tron Sportback uses a configuration that will also be adopted in future production Audi models with all-electric drive: One electric motor on the front axle and two on the rear power all four wheels, transforming the high-performance coupé into a quattro in typical Audi style. 3/11 320 kilowatts of power – which can even reach 370 kW in the boost mode – provide a fitting level of propulsion, with the sprint from 0 to 100 km/h (62.1 mph) a done deal in just 4.5 seconds. With the battery’s energy content of 95 kilowatt-hours, its range is in excess of 500 kilometers (310.7 miles) (NEDC). Audi coupé design In an initial encounter with new forms, the eye seeks out familiar elements. The design of the Audi e-tron Sportback offers these from every perspective – yet it also springs surprises with radically new lines and solutions. One example is the front end of the electric automobile. It still sports the Singleframe, which has been the distinguishing feature of every Audi since 2003. Now, however, its design acknowledges that the function of a classic radiator grille has become obsolete: The electric motor at the front needs nothing like the amount of air that a combustion engine does – so the large opening at the front of the car is no longer required. Behind the familiar octagon of the Singleframe, with its overtly wide, horizontal cut, there is a large-area panel painted in the body color. Its sculptural surface has a structured pattern emblazoned with the four rings logo – just like the grille of the classic Audi Singleframe. The edges of the central surface are drawn back, allowing air to flow through at the top. The air inlet is bracketed again by an octagonal, black-painted frame that structures almost the entire width of the front end. Between the front lid extending low down, the front apron and the wheel arches, it combines with the light units to give this Audi an unmistakable face. The Audi designers also adopt a new tack for the air flow through the front lid. Above its front section, which dips deeply at the front, a bridge running parallel with the nose connects the two wheel arches and also doubles up as an air deflector. This gives the front end a much more dynamic character than the hefty forward structure of a car with a combustion engine installed at the front. A glance at the flank of the Audi e-tron Sportback concept immediately reveals its common ground with two of the brand’s other four-door coupés. The roof line drops down steeply to the rear. The lower edge of the rear side window curves up gently, terminating in an acute angle at the flat C-post – both elements reference the Audi A5 and Audi A7 Sportback. The stretched cabin blends with the car’s SUV-pedigree lower section and the large wheels to create an unmistakable presence. Rising to the rear like a wing, the sill features a sharp hem that helps to contour the lower edges of the large doors. The low-level shoulder line runs around the car into the rear lights, accentuating the body’s horizontal emphasis. The four wheel arches with pointedly horizontal top edges extend well out from the cabin. They shape the conspicuous quattro architecture – not just by providing visual evidence of a wide track and dynamic potential, but also by binding the e-tron Sportback into the brand’s DNA. Large 23-inch wheels in a technical 6-spoke design highlight the confident presence of the imposingly dimensioned coupé. An exterior length of 4.90 meters (16.1 ft), a width of 1.98 meters (6.5 ft) and a height of 1.53 meters (5.0 ft) with a wheelbase of 2.93 meters (9.6 ft) position the e-tron Sportback in the C segment, close to the Audi A7. Small cameras replace the exterior mirrors. This technology offers other advantages besides improved air flow and reduced wind noise. The blind spot of the physical exterior mirror is virtually eliminated, as is the obstruction to the diagonal forward view. The camera images are shown on separate displays in the doors. Audi is showing this technology as a concrete foretaste of the production version. The rear section is kept very neat, with a wide light strip and a prominent separating edge. Here again, the determined horizontality of the quattro wheel arches dominates the proportions. The rear diffuser is visible below the bumper. 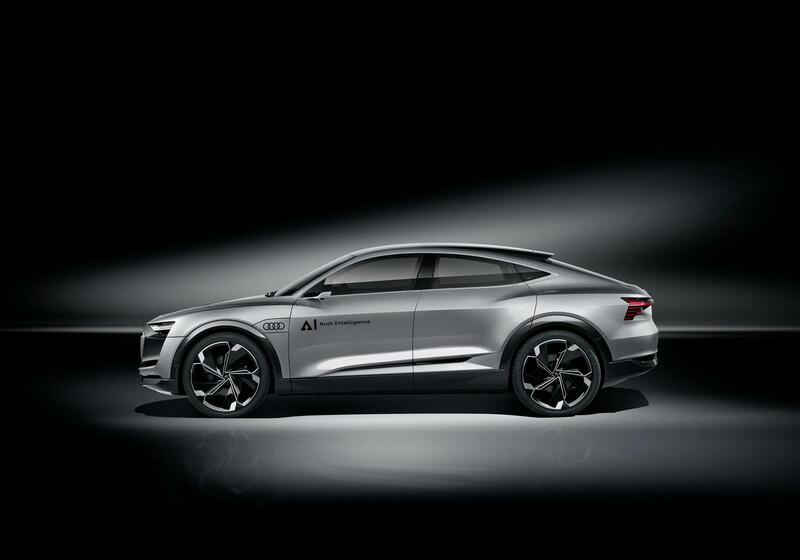 5/11 Illuminating: new highlights of Audi lighting technology Audi opens another chapter of innovations in automotive lighting technology with the e-tron Sportback concept. The brand with the four rings was the first in the world to adopt full LED headlights, and gave Matrix LED technology, laser lighting and OLED technology a significant push towards their breakthrough. The technology study for Shanghai now premieres a whole host of complex functions that steer vision and interaction with the surroundings in a new direction. Narrow light strips on both sides below the front lid – the daytime running lights – become the eyes on the face of the study. Thanks to a combination of LEDs and a micromirror-studded surface plus complex control technology, a large number of animated movements and signatures are possible. When the e-tron Sportback starts and also when the doors are opened, the system uses switchable segments to generate dynamic visual welcome signals. In their basic setting the daytime running lights reveal two rows of finely structured illuminated segments that lend the smooth surface conspicuous three-dimensionality – this is the signature of the e-tron Sportback. The design of the brand logos at the center of the Singleframe and on the rear is no less striking. The four rings, too, are illuminated and appear to float on the dark background. The rear illuminated rings emblem acts as a third brake light. Below the daytime running lights, to the left and right of the Singleframe, there are two large-area light fields each comprising an arrangement of around 250 LEDs. They offer a vast array of possibilities for creating engaging graphics or specific communicative signs, even while on the move. Another highlight is the two projection modules – by the name of Digital Matrix Light (DML) – which are integrated into the car’s front end below the LED fields. These light units, ultra-high resolution laser projectors each with more than 1.3 million pixels, serve as the driving lights and high beams. Oncoming road users can be precisely masked out of the light cone and are not dazzled. A new solution: In narrow passages, the road width required for the car can be projected precisely onto the road by the headlight cone. In construction zones, for example, this helps the driver to spot in advance if they are at risk of drifting out of line – a clear gain in terms of active road safety. The laser projectors can also cast signs on the road surface – such as a zebra crossing pattern if the driver stops to allow a pedestrian to cross the road. Numbers and letters, too, can be produced and animated – enabling graphic-verbal communication with the world outside. LEDs are also used in the large-area rear lights; their characteristic light strip with aluminum edging accentuates the vehicle body’s width and dynamism. External lighting elements that appear to float introduce the typical e-tron signature into the tail lights. Audi’s typical wipe-action turn signals that perform a wiping movement from the inside outwards are also a feature of the rear end. Digital matrix light allows the signaling effect to be markedly intensified, for instance in an emergency brake application. There are small matrix laser projectors on all four edges of the vehicle. These are trained on the road surface, so they can add an extra dimension to dynamic signals such as the wipe-action turn signals, sending out a clear message to other road users. Audi thus yet again steps into the role of lighting pioneer with the e-tron Sportback and demonstrates how effectively improvements to traffic safety can be combined with trendsetting design. outstandingly spacious For the interior, the Audi e-tron Sportback concept draws systematically on the package advantages of a car with battery-electric drive. The energy storage units vanish entirely under the floor, and the electric motors occupy far less space than a combustion engine with all its auxiliaries and voluminous gas tank. Separate electric motors on the front and rear axles means there is no need for a propeller shaft. As a result, the center tunnel console can be positioned independently of any substructure and now appears to hover between the driver and front-passenger seat. This design gives emphasis to the air of light-filled spaciousness, and the apertures in the slender supporting elements can be used as extra storage options. Furthermore, the horizontal bias of the interior architecture increases the impression of spaciousness. The driver and up to three passengers travel on individual seats; there is a generous amount of legroom and shoulder room at the rear. The entire interior is focused on the driving area and controls. The large black-panel display surfaces behind the steering wheel and on the center console appear black when inactive, and turn live together with their display elements as soon as the car is started – a design that is reminiscent of the minimalist screen-based cockpits of modern commercial aircraft. 7/11 The instrument panel descends towards the passengers in two levels; the continuous wrap-around from door to door is a typical element of an Audi interior. One new feature is the design of the vertical surface ahead of the front passenger: It incorporates a wide display that can present the navigation data, weather information and the outside temperature. Below the narrow screen, across its entire width, there are small air vents that have a very tangible design and can be intuitively repositioned. In its normal configuration the luggage compartment of the e-tron Sportback holds 550 liters (19.4 cu ft). With the rear seat backs folded down, the luggage capacity rises to 1,450 liters (51.2 cu ft). 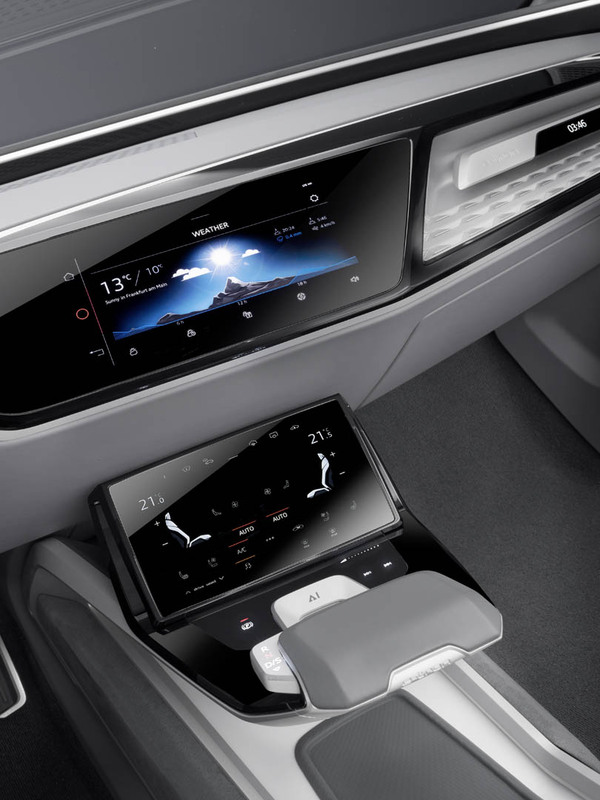 The display and control modules in the Audi e-tron Sportback concept are deeply integrated into the sculptural, horizontal architecture of the cockpit. This is characterized by the large TFT and OLED displays. In its main menu the Audi virtual cockpit behind the steering wheel – framed by a separate, slim cowl – displays the speed, battery charge and range. Its sophisticated graphics give the two-dimensional displays a spatial effect. To the left and right of the Audi virtual cockpit, there are two touch-sensitive control surfaces. The driver uses the compact unit on the left to control the lighting functions. The one on the right – a 10-inch OLED touch display – is for controlling the infotainment and navigation systems. The functions in the main menu appear as a neat arrangement of tiles which each calls up the respective submenus. Important functions can also be operated using hot keys. Below this large display on the center console, there is a further touch-sensitive OLED screen for operating the climate control and various auxiliary functions. All occupants can read off information on the ambient air quality on an overhead module. Towards the front of the door shoulders there is a further display with gently curving surfaces that serves as a digital exterior mirror. Its specially processed camera image is bright even in poor lighting conditions, with good contrast and no glare. The two rear passengers in the Audi e-tron Sportback concept likewise have their own touch displays in the door shoulders. They also use these to operate the climate control and infotainment for their area or to exchange media data with the driver. When the car is stationary, the displays can show the images from the exterior mirror cameras. This helps occupants to locate road users approaching the car from behind before they open the door, reducing the risk of collision. The concept study is connected to the Internet by an LTE module. Passengers can surf the web and send e-mails with their mobile devices. 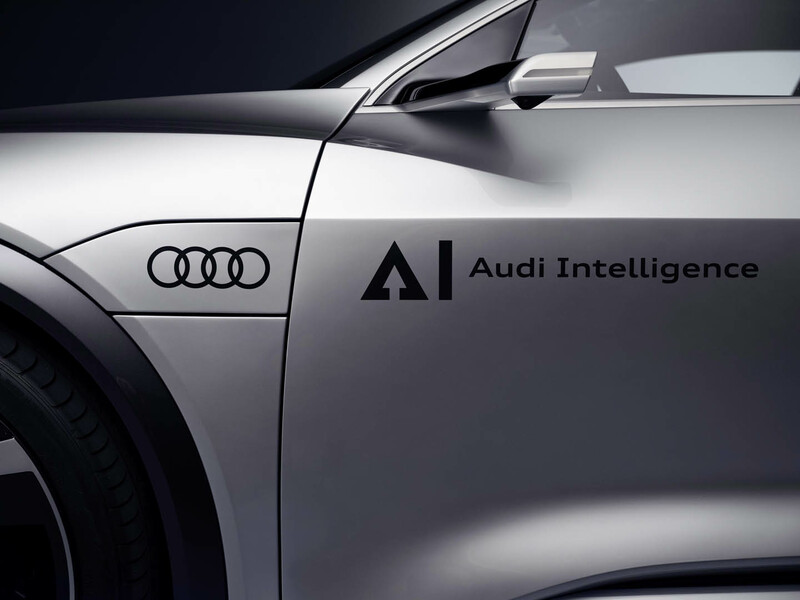 Tailored services from the Audi connect portfolio are delivered to the car for the driver. The driver can also operate many functions of the Audi e-tron Sportback concept from the flat-bottomed steering wheel. Its horizontal spokes are equipped with touch surfaces. The driver selects the recuperation levels with two paddles. The center console includes a flat, slim selector lever with a slide control on its left for selecting the driving programs. The driver moves between the drive positions by gently tapping it forward and back. 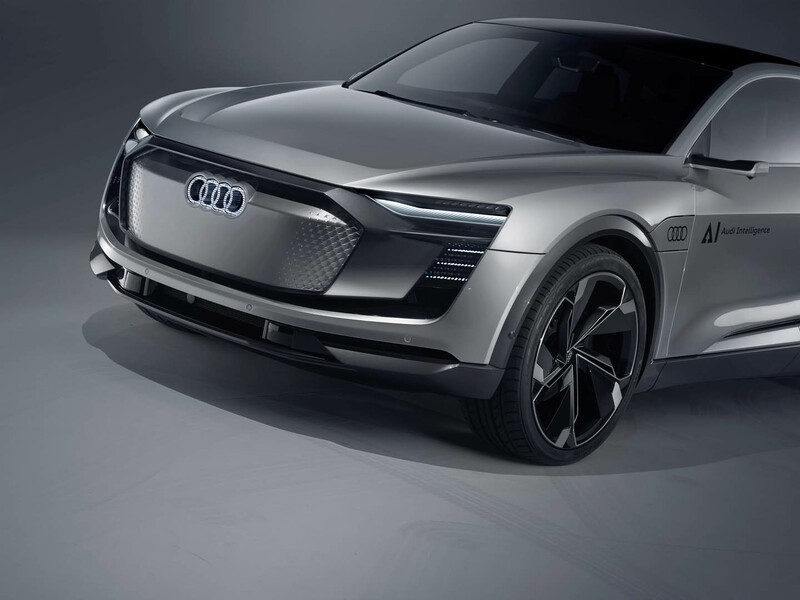 Standard drive configuration for the future: three electric motors The Audi e-tron Sportback concept technology study uses three powerful electric motors – one on the front axle and two on the rear axle. Total output is 320 kW, with boosting enabling the driver to temporarily mobilize up to 370 kW. The electric motors are highly efficient over a wide engine speed range, including at low and intermediate load. They thus combine emotional driving pleasure above all with a high range. The electric motors are liquid-cooled, as are the compact power electronics. 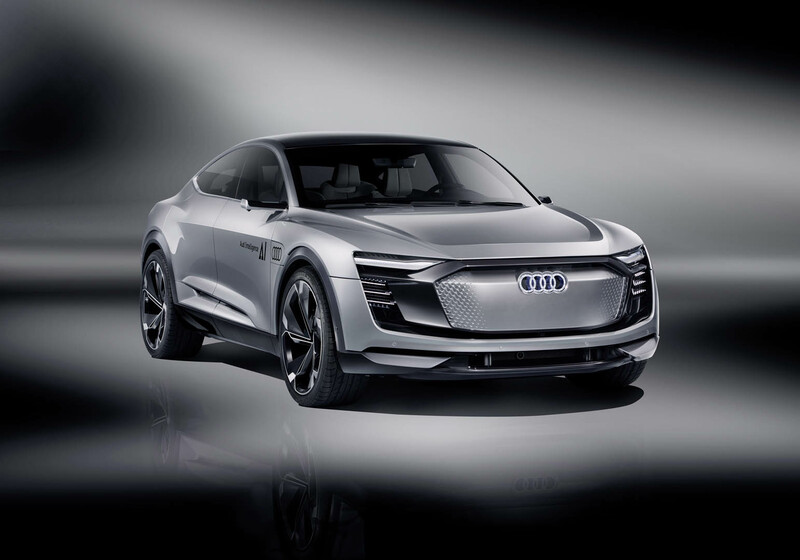 The brand first showcased the concept for the three electric motors in its Audi e-tron quattro concept study car at the 2015 Frankfurt Motor Show. It will now find use in future production versions. And it turns the Audi e-tron Sportback concept into an electrified quattro, because torque is delivered to all four wheels. The operating principle is as follows. A controller continuously computes the optimal interplay of the electric motors for every driving situation. At low load, solely the motor on the front axle is responsible for propulsion. When the driver floors the accelerator in the S driving mode and all three electric motors are working together, 370 kW of output and more than 800 Nm (590.0 lb-ft) of torque are available in the boost mode. The sprint from zero to 100 km/h (62.1 mph) is completed in 4.5 seconds; the electronically limited top speed of 210 km/h (130.5 mph) is quickly reached. In the standard D driving program, the e-tron Sportback musters 320 kW. The key drive train management parameters are the position of the accelerator, the mode chosen in the Audi drive select dynamic handling system, the driving program – S or D – and the battery charge level. The data on the near surroundings from the sensors for piloted driving, the predictive route data from the navigation system and the real-time traffic information from Audi connect also flow into this computation, always with the aim of optimally adjusting the drive train to the prevailing conditions. The focus is on not just powerful performance, but also maximum efficiency. Before even starting out, the driver can have the Audi e-tron Sportback concept compute a drive train strategy to minimize energy consumption. When under way, the Audi e-tron recovers large amounts of energy. Because up to moderate braking, the electric motors are solely responsible for decelerating the vehicle. The hydraulic brakes only come into play for heavy braking. The driver can adjust the degree of recuperation in stages. At the lowest setting, no energy is recovered at all in certain situations. Instead, the isolated drive allows the coupé to coast without any retardation torque – one of the most effective strategies for increasing the range. The concept with the two electric motors on the rear axle offers major advantages when it comes to sporty handling. The Torque Control Manager, which works together with the Electronic Stabilization Control (ESC), actively and variably distributes the power between the wheels as necessary. This torque control provides for maximum dynamics and stability. Thanks to the virtually instantaneous response of the electric motors, the control actions are lightning-quick. The drive concept of the Audi e-tron Sportback concept adapts perfectly to every situation, whether involving transverse or longitudinal dynamics. 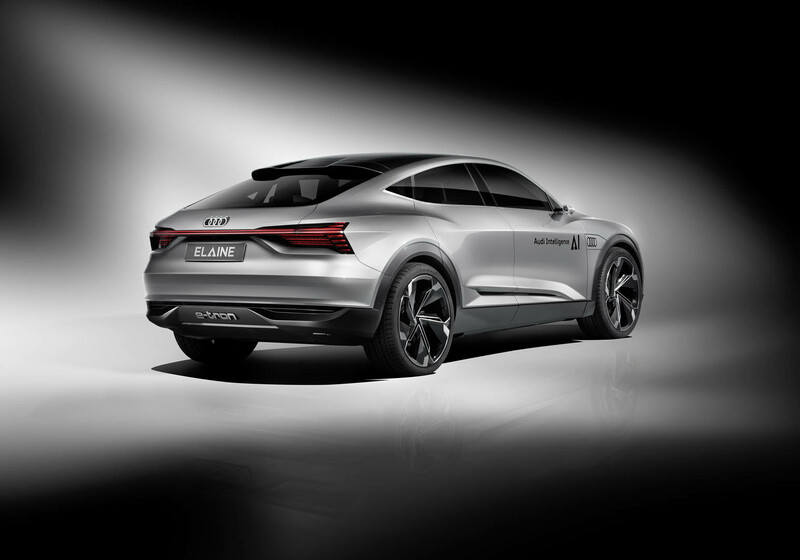 Ideal installation position: the lithium-ion battery As previously on the e-tron quattro concept, the technology study’s lithium-ion battery is positioned between the axles below the passenger compartment. This installation position provides for a low center of gravity and a balanced axle load distribution of 52:48 (front/rear). And that gives the sporty SUV outstanding driving dynamics and driving safety compared with other vehicles in the segment. The large battery block is bolted to the floor structure. Thanks to its modular design, the battery is in principle also suitable for other automobile concepts. The liquid-cooled battery has an energy capacity of 95 kWh. A full charge provides for a range of over 500 kilometers (310.7 miles) in the NEDC. The Combined Charging System with two connectors enables charging with alternating current (AC) and direct current (DC). With direct current and the charging power of 150 kW targeted by Audi, the large battery can store enough energy for up to 400 kilometers (248.5 miles) in around just 30 minutes. With its geometry and slightly inclined installation position, the innovative charging socket on the front fender is particularly ergonomic. Alternatively contactless inductive charging of the Audi e-tron Sportback concept is possible with Audi Wireless Charging (AWC). This is done by siting a charging pad with integral coil on the floor where the car is to be parked, and connecting it to the power supply. The piloted parking system positions the Audi e-tron Sportback concept over the charging pad with centimeter precision. The charging process then starts automatically. The alternating magnetic 10/11 field induces an alternating voltage in the secondary coil fitted in the floor of the car, across the air gap. The alternating current is converted into direct current by the onboard power electronics and the battery is charged with an output of up to eleven kilowatts. The charging process stops automatically when the battery is fully charged. Audi Wireless Charging technology reaches an efficiency of more than 90 percent, making it comparable in efficiency to charging with a cable. The alternating field represents no danger to humans or animals. It is only generated when a car is standing above the induction pad. Drivers can monitor the charging process on their smartphone using an app from the Audi connect portfolio. All charging and climate control functions can be controlled remotely with this app. The heat pump also contributes to the efficiency of the concept study. It uses the waste heat of the electrical components to climatize the interior and is thus a central component of the thermal management system. The chassis reflects the dynamic character of the Audi e-tron Sportback concept. The adaptive air suspension sport – the air suspension with controlled damping – contributes to efficiency. Depending on road speed, the ride height is adjusted in four stages by up to 63 millimeters (3.5 in), thus reducing drag. The adaptive air suspension sport can be controlled using the Audi drive select system. The front and rear axles are lightweight, five-link constructions made of aluminum and high-strength steel. The wheels measure 23 inches in diameter and are fitted with 285/30 tires. Large brake disks with a diameter of 20 inches at the front and 19 inches at the rear slow down the Audi e-tron Sportback concept safely and reliably. Pathway to production – e-mobility at Audi Audi has already been developing models with all-electric or hybrid drive since the late 1980s. The first production offering of a car combining a combustion engine with an electric motor was the Audi duo from 1997, which occupied the body of an Audi A4 Avant. A landmark technological development for electric cars was the Audi R8 e-tron, which was unveiled at the 2009 Frankfurt Motor Show and in 2012 set a record lap time for an electric car on the North Loop of the Nürburg Ring. 11/11 Audi added a first plug-in hybrid to its range in 2014 in the guise of the 150 kW (204 hp) Audi A3 e-tron – its battery units can be recharged by recuperation and cable, and give it an all-electric range of up to 50 kilometers in the NEDC. The Audi Q7 e-tron made its debut in 2016 – it is powered by a combination of a 3.0 TDI and an electric motor which together deliver 275 kW (373 hp) and 700 Nm (516.3 lb ft) of torque. It accelerates from a standing start to 100 km/h (62.1 mph) in 6.2 seconds and is particularly efficient. In all-electric mode, it has a range of up to 56 kilometers (34.8 miles) while producing zero local emissions. It is also the world’s first plug-in hybrid with a V6 compression ignition engine and quattro drive. 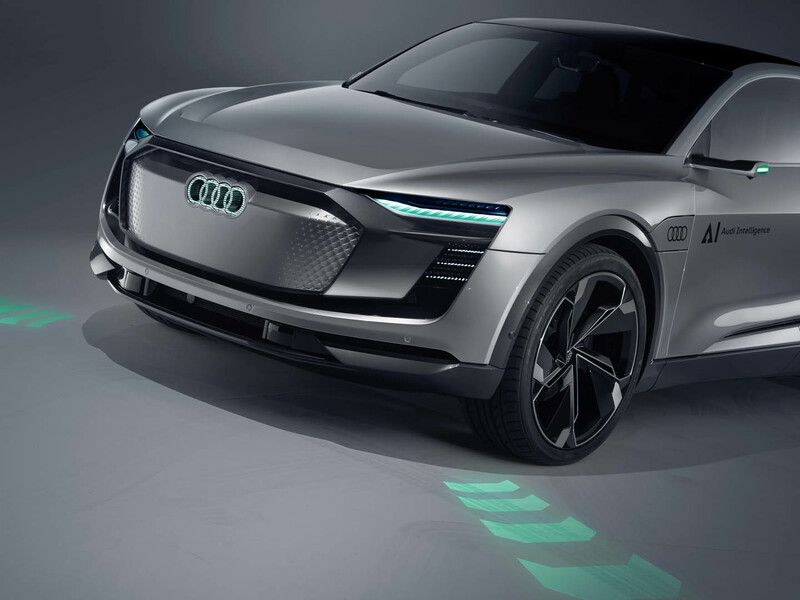 Another concept car unveiled by Audi in 2015, at the Frankfurt Motor Show, was the study vehicle called the e-tron quattro concept – the forerunner of the brand’s first allelectric- drive production automobile. As a radically reconfigured SUV it offers a range of up to 500 kilometers (310.7 miles) with the spaciousness and comfort of a typical full-size automobile from Audi. It has the road performance of a high-performance sports car – the e-tron quattro sprints from 0 to 100 km/h (62.1 mph) in only 4.6 seconds. The production version of this pioneering electric SUV will appear on the market in 2018. The Audi e-tron Sportback concept will be followed by its production version in 2019.